Simple Marketing Blog: Welcome To The Simple Marketing Blog! Welcome to the Simple Marketing Blog, the blog and newsroom for Simple Marketing Now LLC, a marketing communications consultancy focused on simplifying customer interactions. This 'Simplify' sign hangs in my office. Jim Schnurbusch from Hughes handed it out during a presentation possibly in August of 2005? In any case, it resonated with me then. And continues to do so today. It reminds me not to get distracted with bells and whistles, but rather to focus on what's really important and how best to get that message across to core customers. The notion of 'Simplify' lies at the heart of my experimentation with new forms of marketing and trying to figure out how to more effectively and efficiently connect with customers. That's what led me to launch Flooring The Consumer in June of 2006, and become immersed in the world of social media and social networking. 'Simplify' inspired me as I launched The Carpetology Blog in December 2007 and the redesigned Wear-Dated website in June 2008: How to simplify the carpet buying experience for consumers, how to make sense of a complex category, how to make finding relevant information easier online, how not to wear the consumer out online. 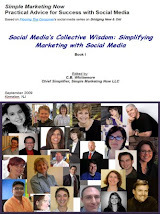 It continues to inspire me for Simple Marketing Now LLC and for this blog. In this blog, I will share best practices about how marketers - particularly ones in traditional industries - are simplifying their customer interactions and bridging traditional marketing communications with tools that simplify and develop stronger connections with customers. I'll describe tools that seem particularly relevant and practical, along with how to be successful using them. Yes, I'll be generally celebrating practical approaches to marketing. I will also share with you news and releases relating to Simple Marketing Now. I expect that other ideas and topics will come up along the way and hope you will find them relevant. In case it isn't obvious, you will be exposed to my views. You are more than welcome to respond, add comments and suggestions. Even disagree. I ask that we keep our comments relevant to the conversations taking place here so that we can maintain respect for all those involved and add value and depth to the discussion. I moderate comments and will quickly remove any that are offensive, disrespectful or irrelevant. That means that if you simply come by to advertise your [irrelevant] website [n.b., often considered SPAM], your comment will be deleted. However, if you truly want to add to the conversation and engage, then I welcome your perspective. Oh, and please don't post any private information as this is a public forum. I might repost your comments and/or try to reach you to add more depth to the discussion. I encourage you to visit the Simple Marketing Now website and learn about us, about what we offer and who we are. And, do feel free to contact us for more information! Please consider subscribing and engaging in discussion around the notion of 'simple marketing' which I believe will become more important than ever. I have enjoyed your Flooring the Customer blog for over a year. I am a sales associate at a flooring store and beause we could not make changes to our website-I started a blog for our store with updates on sales and products that customers might not know about. Thanks for your inspiration. Chris, thanks for stopping by and sharing your story. I am delighted that you have found a solution and I look forward to hearing more.